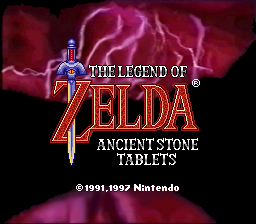 Please read our emulation info page for details concerning the offered roms, compatibility and legal! As you move one from week to week, you may wish to rename the previous week's srm save file to match the file name of the successive one. That way you will be able to carry on all your progress. Official Week 1 - REPATCHED 11/19/18: Small cosmetical indoor fixes. Official Week 2 - REPATCHED 11/19/18: Small cosmetical indoor fixes. Official Week 3 - REPATCHED 11/19/18: Small cosmetical indoor fixes. Official Week 4 - REPATCHED 11/19/18: Small cosmetical indoor fixes. 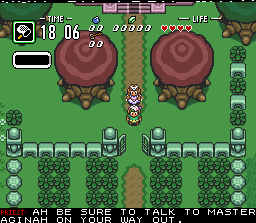 The English Dub MSU1 patch enables msu streaming (supported only by snes9x 1.55 bsnes/higan/sd2snes). This patch enables a full restoration of the original broadcast in CD-quality, dubbed in English! Find the location of the required files and how to set it up in the readme included in the patch folder. 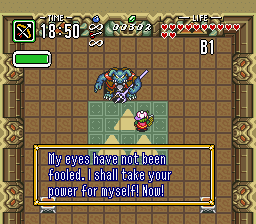 With a small trick it also works with the Master Quest - read the readme for details. 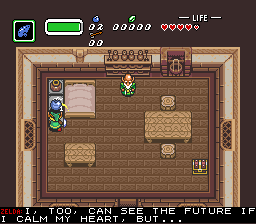 The SPC Replacement MSU1 patch enables msu streaming (supported only by snes9x 1.55 bsnes/higan/sd2snes) - Themes (ALBW/Parallel Worlds Interpretation by Quertymodo. 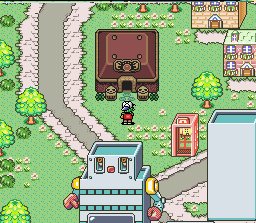 Other than the English Dub MSU1 patch, where you have one hour straight forward audio with speech, this one substitutes location sensitive the original spc with full orchestrated audio. 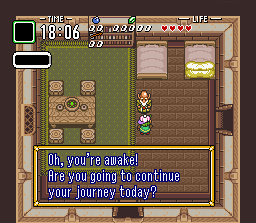 Means, if you leave a dungeon to the overworld, just alike in the native rom, the music will change. Find the location of the required files and how to set it up in the readme included in the patch folder. - Translations: German Translation v2.0, a French Translation, a Spanish Translation (textboxes only), and a Japanese Restoration. 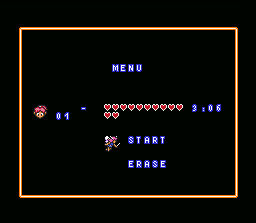 If you apply the msu1 patch, the translation should be preapplied on your rom. These translations work on Official version only (also the french MQ translation must be applied on the Official). - File Migration Note: zsnes/snes9x/bsnes/sd2snes: As soon you have finished a week, rename your sram to the name of the next week's rom to carry on all your progress. E.g., Week 1 sram name is bszelda_ast1.srm. 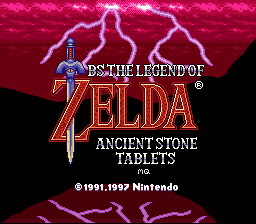 As soon you have finished this rom and want to start over with week 2, rename this file to bszelda_ast2.srm; then simply copy this file in the folder with your bszelda_ast2.smc rom. Higan: Import all weeks first. 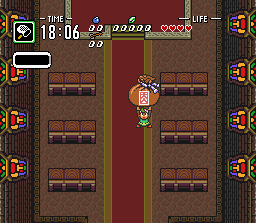 As soon you finished a week; e.g., week1, go into your bszelda_ast1.sfc folder (usually: %USERPROFILE%\Emulation\Super Famicom\) and copy the save.ram file. Paste it into the bszelda_ast2.sfc folder (if a save.ram already exists (depends on the higan version), just click yes at the replace window). snes9x/sd2snes: These emulators enable a neat, alternative method, with which you don't have to rename the srm - Read more about it. Master Quest Week 1 - REPATCHED 08/15/18: Music respawn disabled. Master Quest Week 2 - REPATCHED 08/15/18: Music respawn disabled. 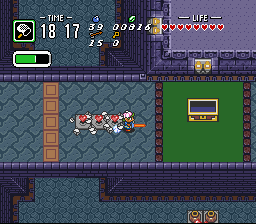 Master Quest Week 3 - REPATCHED 08/15/18: Music respawn disabled. Master Quest Week 4 - REPATCHED 08/15/18: Music respawn disabled. 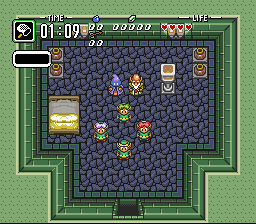 - File Migration Note: zsnes/snes9x/bsnes/sd2snes: As soon you have finished a week, rename your sram to the name of the next week's rom to carry on all your progress. E.g., Week 1 sram name is bszelda_mq1.srm. 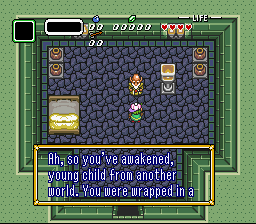 As soon you have finished this rom and want to start over with week 2, rename this file to bszelda_mq2.srm; then simply copy this file in the folder with your bszelda_ast2.smc rom. Higan: Import all weeks first. 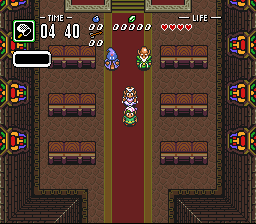 As soon you finished a week; e.g., week1, go into your bszelda_mq1.sfc folder (usually: %USERPROFILE%\Emulation\Super Famicom\) and copy the save.ram file. Paste it into the bszelda_mq2.sfc folder (if a save.ram already exists (depends on the higan version), just click yes at the replace window). This patch MUST be applied first before any other patches are applied. - have dungeons, caves and houses 100% exactly as they were meant to be! This patch MUST be applied after the Base patch listed above to work. This upgrade patch MUST be aplied after the Base Patch and the Indoors Patch! This base patch translates the japanese kanji into English (already applied on Official and MQ version). Apply on the Official version. 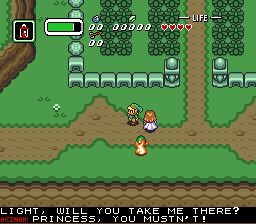 The patch does not work properly with the Master Quest version. The package conatins an Official and a MQ version. Apply both versions on the Official roms (means, also the MQ versions must be applied on the !official! AST roms and not the MQ roms). - play in Spanish - English patch must be preapplied. Translated are textboxes only, neither menu, slides nor sublines. Inside the zip file you will find a program by SmashManiac that creates the sublines (if you want to create some yourself). Further there are different sublines patches for week 3 and 4 in this file, used when the itemfix patch is applied (you'll find the Book of Mudora and the Mighty Boomerang yourself). This upgrade patch MUST be aplied after the Base Patch, Indoors Patch and Upgrade patch! both in the game and the menu. Week 3 and 4 only. Week 3 ips file must be applied if you want all items in week 4. Week 4 has different versions for the Official resp. Master Quest indoors (take care to apply the correct patch!). means you'll have unlimited time to end a week and also play all the timed events. the other (clockvisible) still shows the timer and features only the loop of the last minute until your mission is accomplished. Note that week 2 patch doesn't work without the music patch. The zip contains two patches that need to be applied to week 3 and week 4 respectively. 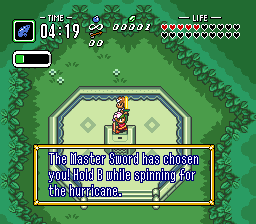 - Perform the Hurricane Spin technique once you obtain the Master Sword by pressing and holding down the B button during a spin attack. 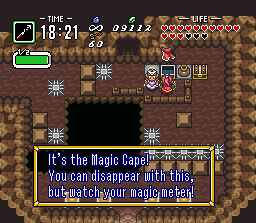 But keep an eye on your magic meter! Note that the official title screen (upgrade patch) must be applied to the rom before you can use this patch to replace it! 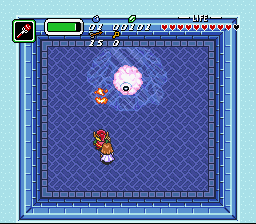 - remove the overworld music that Dreamer Nom restored. This patch was made both because we realized the music really was not supposed to be heard (CD quality music was to be streamed while playing the game) and because some people prefer to play their own music while playing the game without being interrupted by just one track only heard on occasion. - originally created before recordings of the orignal broadcasts surfaced. Again, any of these patches MUST be applied after the Base Patch listed above to work. Just take this patch instead of the official indoors patch! - switch from the boy to the girl and viceversa. It won't work together with Roto's patch. 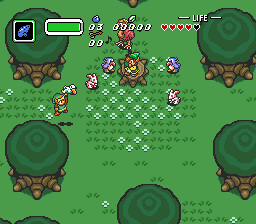 - replaces the mascot's head with Link's. You'll need ips exe or IPS Win to patch the rom. Near the end of year 2007, videos of entire play sessions were found on NicoVideo. Showing every room in the game, these videos made it possible to create 100% accurate indoor patches. What's more, the videos contain all the soundtrack and voice acting used in the game. Kiddo Cabusses used his YouTube account to upload them so now we can all see them. Furthermore, the voice acting for each week has been translated. Here is a part of the Zelda no Video DVD documentary that was released in Japan. It is posted here because it shows several things from AST that are lost to us: the title screen and introduction, the voices and a few indoor sequences. For everybody's convenience, this Divx AVI it is split in four RAR files; to view it you must download them all in the same folder and then extract the file. Thanks to DeGamer for converting these files from the DVD and to Cent208 for sending it to me. 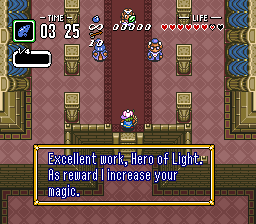 Looseless quality flac files of the music from Zelda Sound & Drama which was used in the game's original broadcast can be found on this SoundCloud account thanks to Kiddo Cabusses. Alternatively, you can download smaller mp3 files from the links below. Thanks to Cent for making the files and Heran Bago for hosting them! Available here is Euclid's editor that allowed us to fix this game. Feel free to use it to customize your game as much as it allows (which may not be as much as you'd like seeing as it was conceived with the sole purpose of inserting what the game was missing). Instructions for use are found inside. 1, Use IPS Win to apply optional patches. 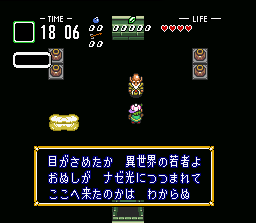 2, Here is the text dump in both Japanese and English for BS Zelda Ancient Stone Tablets (doc format). 3, For those who wish to try fixing the game, here and here are some technical information Dreamer Nom and Okibi respectively sent me. DN also gave me this study of the music in BS-X games. Additionally check this back ups of a thread on the SNES9X forum. 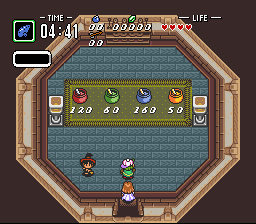 4, Because MP3 files are pretty large, I've decided to also distribute a few Midis from A Link to the Past for people to listen while they play the game. 5, Here is a Graphic Decoder made by Dreamer Nom for AST. It creates a small file (which you can view with any tools such as tile layer) with all the grahics from the game that can be found. That's about all I know of it, so I'm afraid I won't be able to answer any possible questions.